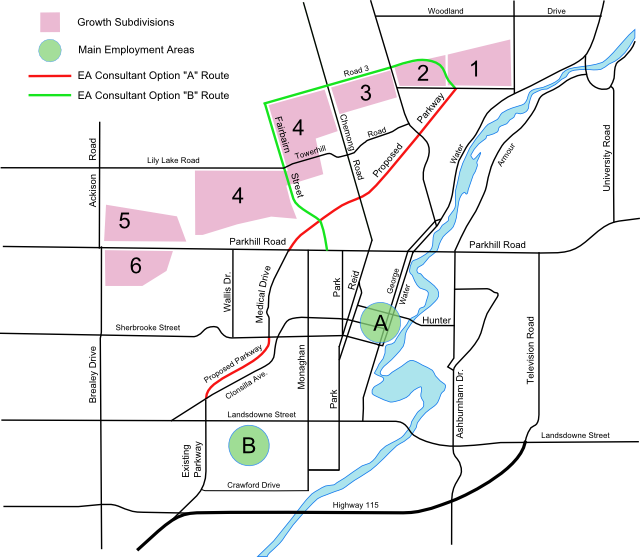 It is clear, Plan B, the Road 3-Fairbairn option represents a better choice for Peterborough. Why? So, why are the consultants and City Council so intent on getting that extra 6% at such a high and destructive cost? We simply don’t know and we don’t understand. Option A gives one side everything and the other side nothing. Option B gives BOTH sides nearly everything. Why is City Council choosing Option A? 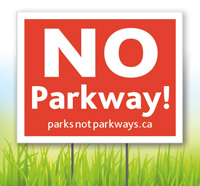 We have often stated that the EA process has appeared biased towards the Parkway option from the beginning. Nowhere is this perhaps more evident in the final evaluation between the two best options. Using City numbers that were hidden from public scrutiny until after City Council made its decision on the Parkway, we can see the gains we will get if we opt to destroy over one-third of our north-end greenspace: one point four minutes of travel time and a solution that is six percent better than Option B. This is insane. The EA proposals are all based on the positive aspects of Parkway option and totally ignore the damage they will do to the quality of life in Peterborough and other negatives of the Parkway option. This uneven evaluation of the options is part of the reason we feel the EA is biased. Critics, who don’t want to discuss our ideas and would rather just demonize us, have called us anti-development, anti-cars, anti-growth, anti-housing, anti-change, anti-everything. Nothing could be further from the truth. We understand that modern cities need effective transportation systems and that we are still, for the most part, a car-centric culture. We believe the Parkway option is simply the wrong transportation choice and is based on outdated thinking, incomplete analysis and a biased, pre-determined process designed to serve the needs of a select few. To us, intelligent decision making means you weigh all options fairly. You choose by evaluating the good AND the bad. The Parkway option might get the most good (an assumption we disagree with) but it also comes with a massive cost: the loss of over a third of our greenspace and a bridge through our best park. While we can quibble about the numbers, a SIGNIFICANT portion of the population feels the environmental cost of Plan A is much, much too high. It is unfortunate, no, scandalous, that this cost was NEVER meaningfully considered in the EA evaluation process. When you consider that option B brings 94% of the benefit at a tiny fraction of the cost, we word we want to use is immoral. If you agree, then please, Act Now!